Heroes star Greg Grunberg co-creates free money saving iPhone and iPod Touch app designed to benefit consumers and stimulate retail industry. National wholesale distributor, Sysco, and retailers such as Sears, Finish Line, Saks Fifth Avenue, Sports Authority, McDonald's, The Container Store, Pier 1 Imports, REI, Regency Shopping Centers, Rubio's Fresh Mexican Grill, Kiehl's and California Pizza Kitchen among first to sign on. Yowza! !, an innovative application designed to save consumers money and stimulate retail businesses is now available on the Apple App Store. Yowza!! is a free application for the iPhone and iPod Touch that removes the need for consumers to clip coupons or print out emails with promo codes because all of the deals are now offered direct to the user's device. Users simply show the barcode and digital mobile coupon on their iPhone or iPod Touch at checkout to redeem the discount on their purchase. Retailers that have already signed with Yowza!! include Sears, McDonald's, Finish Line, ESPN Zone, The Container Store, Islands Restaurant, Sports Authority, Rubio's Fresh Mexican Grill, Pier 1 Imports, REI, Saks Fifth Avenue, Regency Shopping Centers, California Pizza Kitchen, American Golf Corporation, Cavallo Point Lodge, Marmalade Café, Traditional Jewelers, American Car Movers, Aveda Salon/Spa, Inner You Pilates, JRK Hotel Group, Cheeseburger Restaurants, Kiehl's, Midway Car Rental, Santana Row Shopping Center, Seaton, Jill Roberts, and Paige Premium Denim as well as Sysco, a national wholesale distributor. More merchants will be announced in the coming weeks. Sysco, which has sales and service relationships with approximately 400,000 customers and remains committed to helping them succeed in the foodservice industry and satisfy consumers' appetites, though Sysco iCare, will begin an extensive partnership with Yowza!! this week starting in the 2nd largest market, Los Angeles and rolling out to surrounding cities and states throughout the year. Sysco's product lines include not only the ingredients needed to prepare meals but also numerous ancillary preparation and serving items. Sysco iCare offers a suite of value-added resources specifically designed to help the restaurant operator to boost sales, and to hire and retain the industry's best employees. iCare makes a difference in its customers' lives and the success of their businesses by streamlining and protecting business operations, and through the partnership with Yowza! !, making dining out more enjoyable as well as more affordable. Greg Grunberg, star of the NBC hit "Heroes" and Co-Founder of Yowza!! said, "I created the app to share my passion for saving money and time so you could consider this my contribution to the stimulus package! I play a hero on television and now, hopefully, I can be one in real life by helping people during these tough economic times." "The iPhone and iPod Touch are such brilliant devices and have allowed our business initiative to become a reality," said Grunberg. "I met these two technology rock stars through Twitter of all places, August Trometer and Rick Yaeger, who had the expertise and experience to execute my vision for the business. 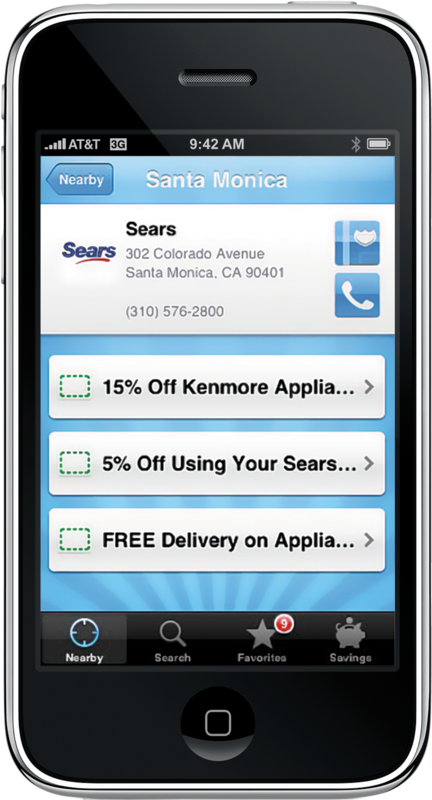 Mobile couponing is convenient for both busy consumers and our younger generation that are technology savvy. The results we have seen already indicate a tremendous potential for Yowza!!" Brands such as Sears, which is the nation's fifth largest broadline retailer, the leading home appliance company and a major supplier of tools, lawn and garden, home electronics and automotive repair and maintenance, see enormous value in offering their customers the best deals, discounts and offers via Yowza!! 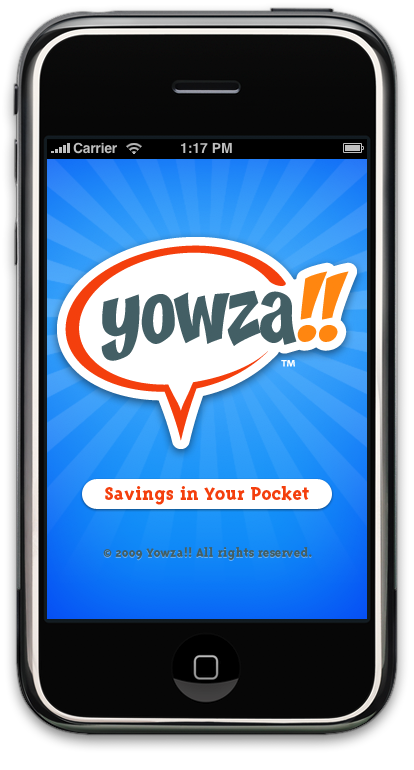 "The Yowza app is one more way the Sears Blue Appliance Crew allows you to shop your way by providing the best deals on appliances right on your iPhone," said Michael Léger, Merchandise Manager, Online & Emerging Media for Home Appliances at Sears Holdings Corp. "The big advantage with Yowza is we can bring relevant offers to customers based on their location and needs. For example, if the Midwest is under a heat wave, we now have the capability to provide savings on air conditioners in their area, in real-time - that's truly a best in class experience," Léger added. The Sears Blue Appliance Crew will be live today on Yowza!! Yowza!! not only provides the user with amazing deals and discounts, it gives the business owner the ability to monitor performance on a daily, up to the minute basis. Unlike traditional forms of couponing such as newspaper ads and insertions, Yowza!! offers can be updated instantly and targeted per region or particular store location. Grunberg, who was featured in NBC's Green Week commercials, is proud to be able to offer coupons in a form that is environmentally friendly. "It couldn't be more green -- no printing, no delivery, no paper. It's all digital," he said. New Yowza!! upgrades and features to be announced in the next few weeks. Yowza!! is available for free from Apple's App Store on iPhone and iPod Touch or by searching "Yowza!!" at http://www.itunes.com/appstore/. Retailers big and small who want to join Yowza!! should visit: http://getyowza.com. Sysco iCare customers interested in participating should visit http://getyowza.com/sysco. Grunberg stars in NBC's Emmy and Golden Globe-nominated ensemble series "Heroes" as Matt Parkman. A multi-hyphenate talent, he has also written and produced for TV & Film, appeared in "Mission Impossible 3," "Malibu's Most Wanted" and "Hollow Man" among others, and starred in other acclaimed television series such as "Alias" and "Felicity." Grunberg is also a philanthropist, creating BANDFROMTV, which has helped raise more than $2 million dollars for charity, and TalkAboutIt.org - a website devoted to helping those affected by Epilepsy. Trometer has enjoyed a multifaceted career and has been programming for the Mac platform for many years under the name FoggyNoggin Software. He is one of the first iPhone developers on the App Store scene with the launch of the acclaimed Loan Shark app. Trometer is also the founder of dotmac.info, the only "community" site for Apple's .Mac members, and the creator of iPodderX, the first third-party utility for Podcasting. Yaeger has spent 20-plus years working on numerous award-winning graphic design and marketing campaigns, as well as a tech blogger, podcaster and on-air personality for a number of technology programs. He met Trometer through the audio podcast The Wizards of Technology. The two became very active on Twitter, where they met Grunberg. For more information on Yowza!! please visit http://www.getyowza.com or http://www.twitter.com/yowza. The Lippin Group for Yowza! !